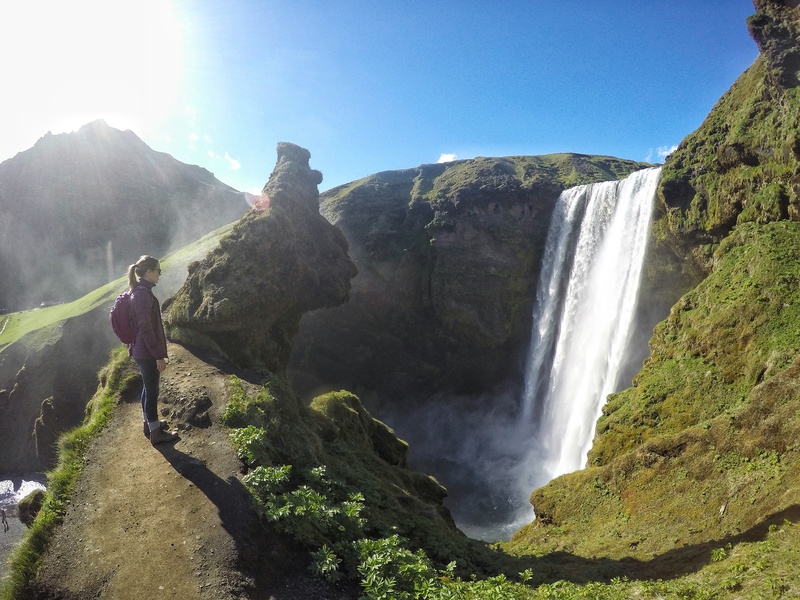 After wrapping up 2 days of brilliant sunshine in Vik and it’s surroundings, we began to make our way back west for the next leg of our journey. 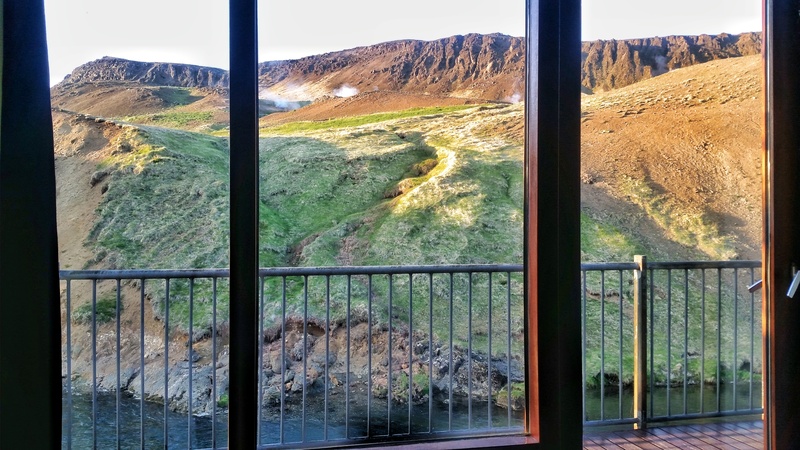 I had booked us in the town of Hveragerði in the southwest corner of Iceland for a night at a guesthouse called Frost og Funi, which translates to Frost and Fire. 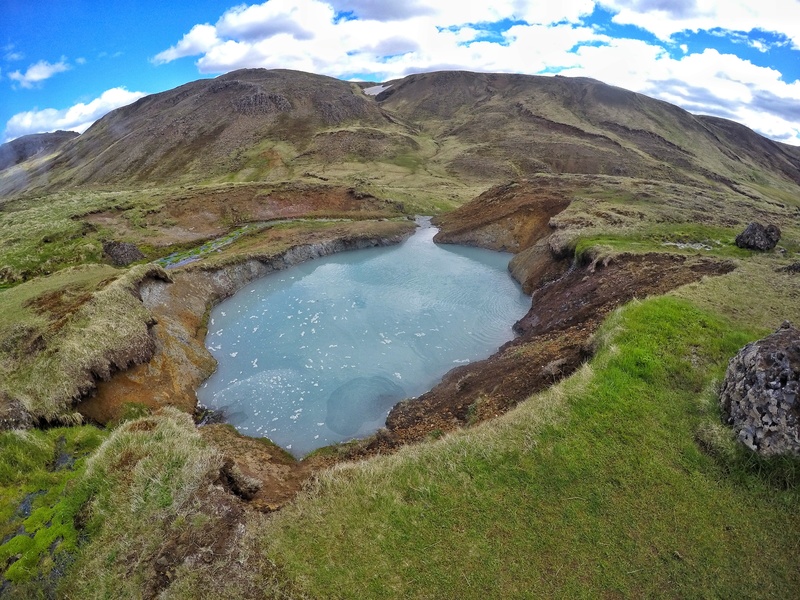 Hveragerði is known for being a very geothermally active town with frequent, yet minor earthquakes. 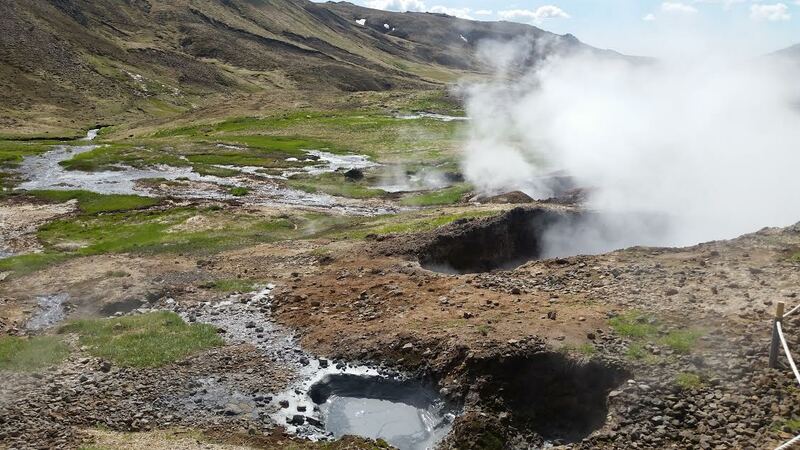 Frost og Funi is situated in the midst of a very active geothermal area which they take advantage of with their on site hot pots and heated swimming pool. More on the guesthouse later in this post. 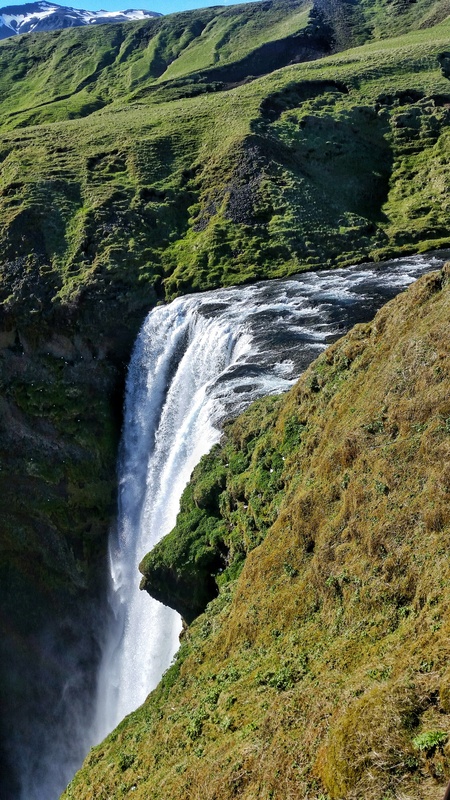 Our first stop on the way back from Vik was at Skogafoss, a massive waterfall that reminds me of a huge curtain draped from the side of the cliff. We had originally planned to stop here on our way east, but time and rain prevented us from doing so. It’s a good thing we waited because today was another day of straight up blue skies and nice temperatures. 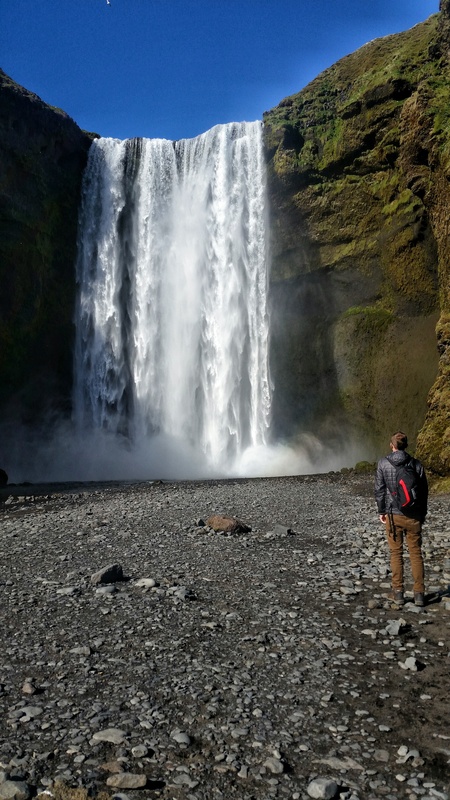 Legend holds that a buried viking treasure is hidden behind the falls, but I wasn’t about to go looking for it. A very steep set of stairs climbed the hill alongside the waterfall leading to an incredible viewpoint at the top of the falls. 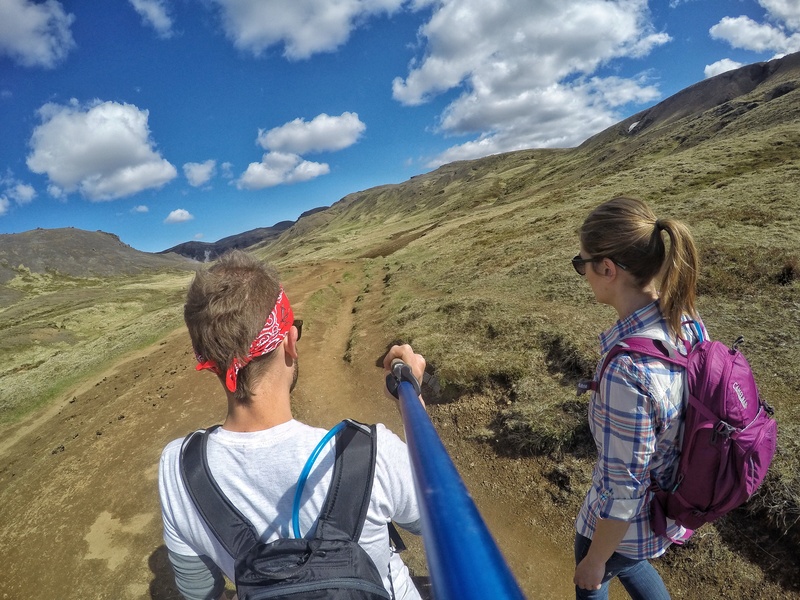 This is also the start of a multi-day trek that leads off into Þórsmörk (pronouned “thorsmork), but we were just here for a quick visit. Some areas of this section are definitely not meant for those with a fear of heights or vertigo. After Skogafoss, we continued on our journey westward, stopping at whatever things looked beautiful enough to warrant our attention. One particular waterfall down a gravel road off the Ring Road looked particularly appealing, so we made a quick pitstop to check it out. Bonus points for us being the only people there! I have no idea the name of this one, but it was a fun little jaunt! After about 2 hours of completely mind blowing scenery along the Ring Road heading west, we arrived in Hveragerði. We first stopped at the main shopping center in town to replenish the ice in our pitiful beer cooler that we found on our first day (I use the term “cooler” loosely, it was literally just a plastic tub with a lid on it, and the ice would only last for about 4 hours in it because it had no insulation). Within the shopping center was an earthquake simulator and some mock-ups of typical earthquake damage. Pretty neato for a geology nerd like me. 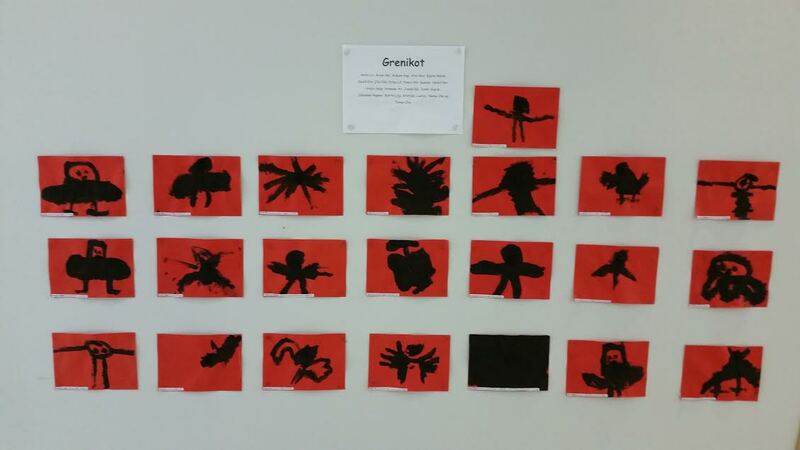 Also, within the tourist information center was this display of children’s artwork of something called “Grenikot”. Not sure what it is, but it looks terrifying! I thought this was amazing. I especially love the one on the bottom row, third from the right, where the kid just colored the whole thing black. This thing must be really evil. 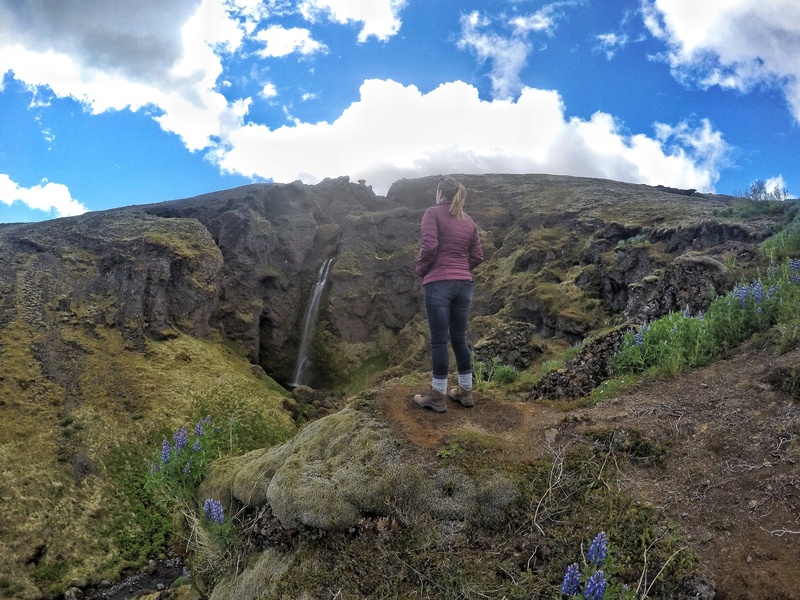 Before checking in to Frost og Funi, we immediately made our way to the trailhead for the Reykjadalur hike. 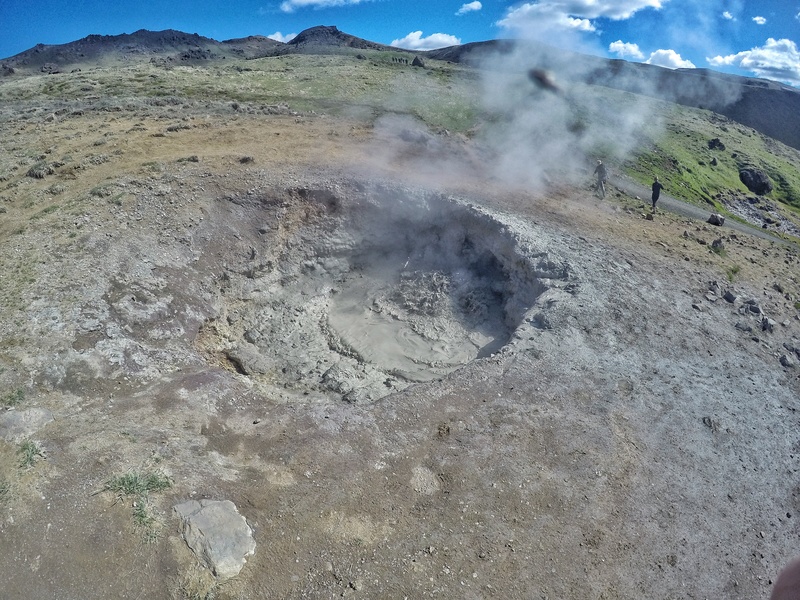 The word “Reykja” translates to “smoke” and “dalur” to “valley”, so it literally translates to “the smoke valley”, named because of the vast amount of geothermal vents along the hike and in the valley that emit vast amounts of steam. We arrived pretty early in the morning, and we wanted to stick with our “before 10 AM rule”. We parked at the trailhead, threw together a couple of peanut butter and jelly sandwiches for the backpacks, and hit the trail. 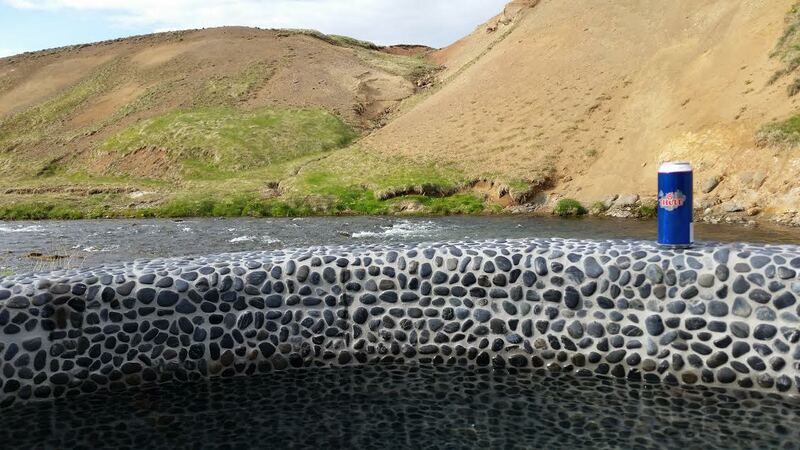 The main draw of the Reykjadalur hike is the hot river at the end of it. 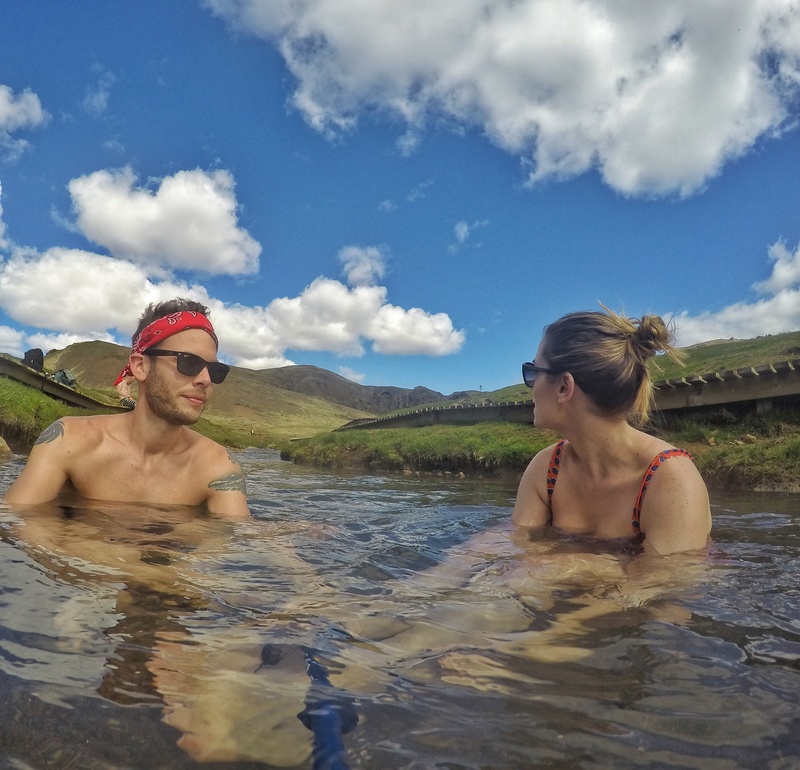 A boiling hot geothermal river merges with an ice cold glacial melt river creating a perfectly heated warm stream in which you can take a dip. It sounded like the perfect end of a hike to me! The hike started off a bit rough – the air temperature was a bit warm and there were these awful giant flies that would just swarm around our heads, going up our noses, in our ears, mouths, everything. It was really annoying and not the most pleasant of experiences. Nonetheless, the views were spectacular. 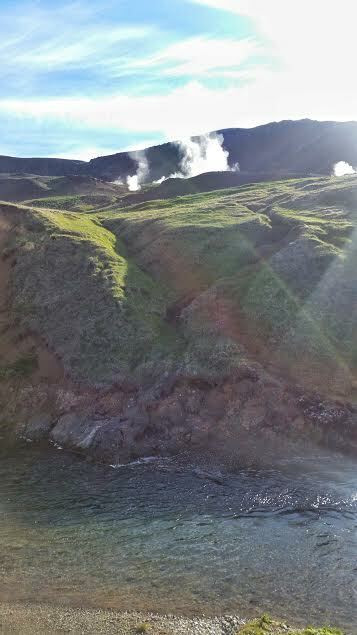 We passed many boiling mud holes and geothermal vents toward the start of the hike. At one point, we passed a boiling pond with a bunch of sheep lounging around the warm steam. The smell everywhere was very sulfurous, but we quickly got pretty used to it. Then we came to a stunning view over the valley, and it almost literally took my breath away. After about an hour or so, the uphill slog finally leveled out, and we were able to take it a little easier. Eventually we reached the apex of the hike: the hot river. There were only a handful of other people around, so we had our choice of places to jump in. There were a couple of “privacy” walls around for which to change into your swimsuit, but we just opted to go up the hill a little bit to get changed. We then found a good place to enter in, and found the water temperature to be perfect. I really felt this to be the best payoff to any hike I’ve ever taken. 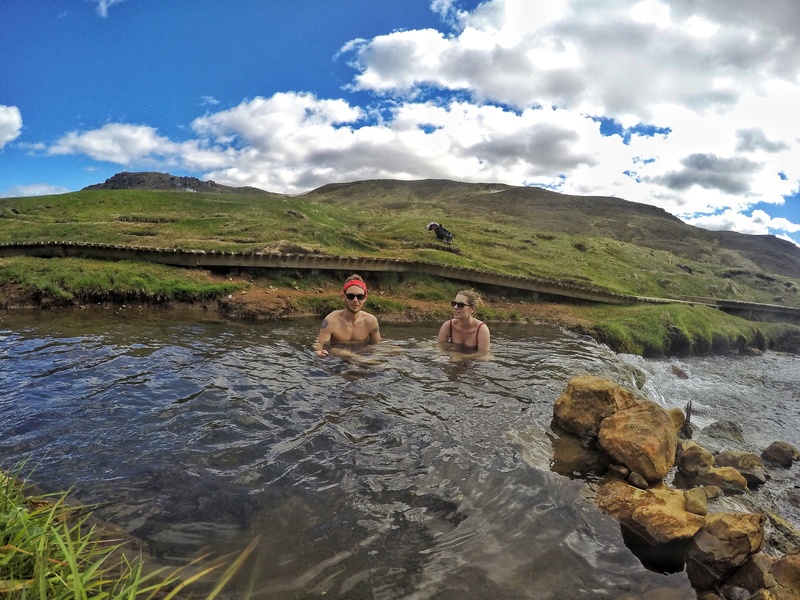 I mean, after a semi-strenuous hike, what better way to end it than with a warm soak to rest and relax? We played around and soaked in the water for maybe an hour or so, before getting out and heading back up the hill to change into our hiking gear and eat our sandwiches. By this point, more and more hikers were beginning to arrive, and there was no longer the feeling of solitude we had upon first arrival. 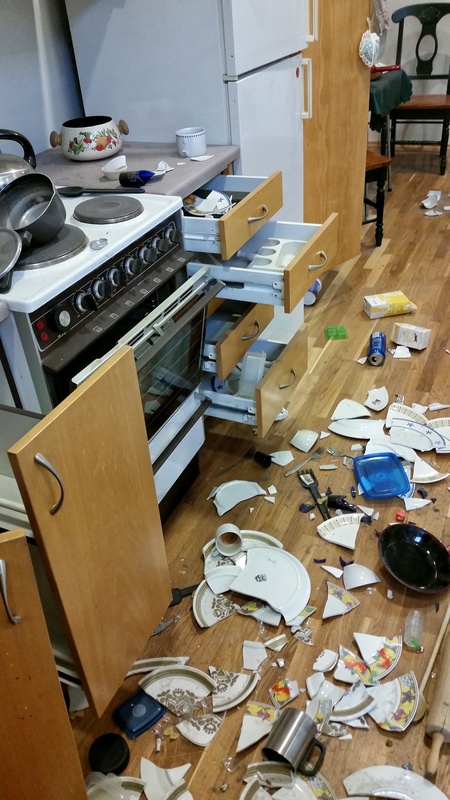 It had become “Iceland crowded”. This was an out and back trail, so we took the same path we came in on, got swarmed by flies again, and passed so many people hiking toward the river. We were so glad we had gotten there when we did. When we finally arrived back at the trailhead, we could see why: tour buses and cars were lining the street to the trail head for probably a full kilometer. It was insane. It looked like a music festival was going on. Again, our 10AM or earlier start time had paid off. At this point, we were only about an hour’s drive from the most touristed part of Iceland, known as the Golden Circle. 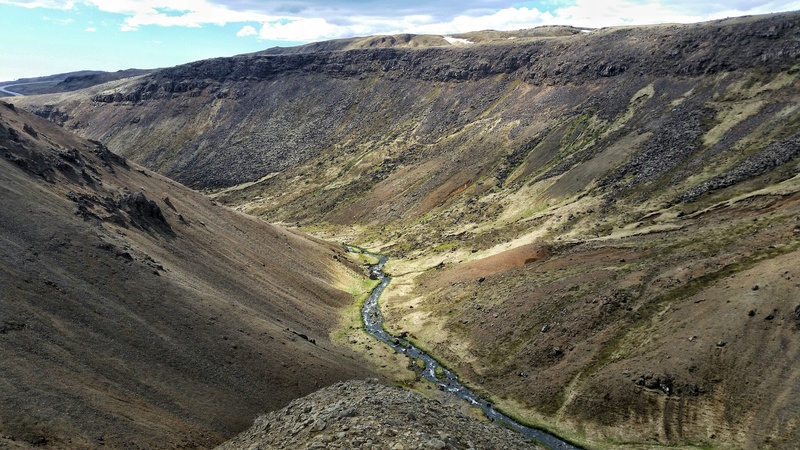 The Golden Circle experiences such popularity because of it’s proximity to the capital, Reykjavik, and also because of the high concentration of amazing sights to be found there. 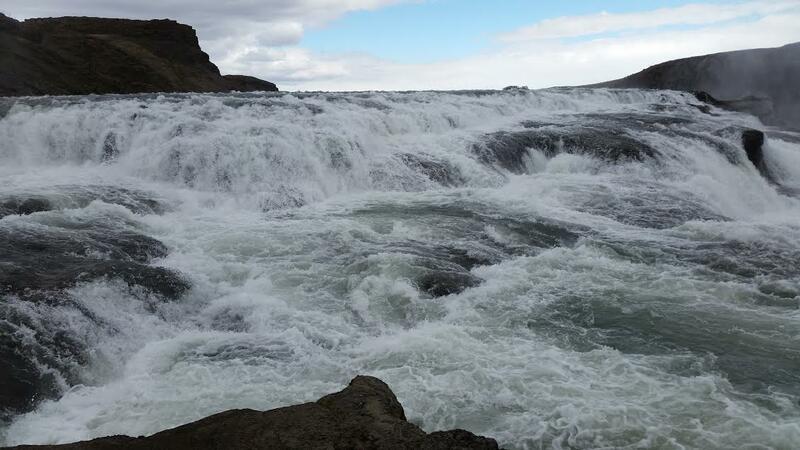 The three most touristed attractions in Iceland are located here: Gullfoss (the golden waterfall), Geysir (the one for which all geysers are named), and Þingvellir (pronounced Thingvetlir) national park, site of the boundary of the European and North American plates. We skipped Þingvellir, but went to Geysir and Gullfoss. Both were pretty cool, but definitely had the crowds. This was at Geysir. The story about Geysir (pronounced Gay-seer) is that it was a regularly erupting geyser up until around the 1980’s when, after decades of people pouring powdered soap down the hole to instigate an eruption, it finally clogged up and stopped erupting. The one that erupts now is nearby Geysir, and is called Strokkur, which is pictured above. It erupts every 5 to 8 minutes. 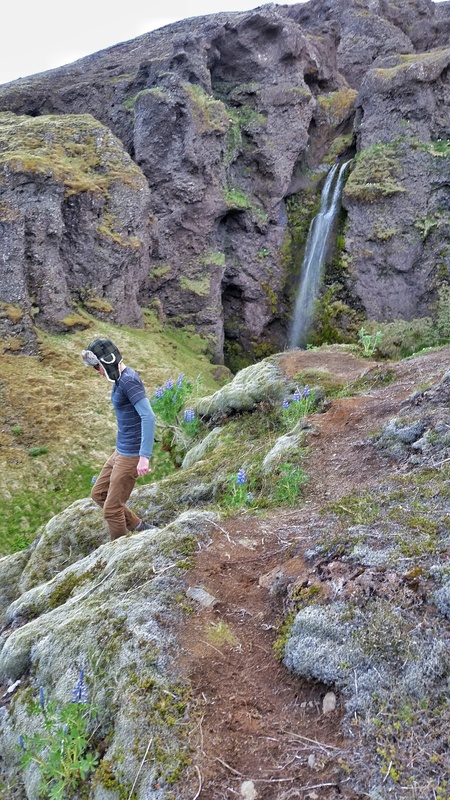 Prior to each eruption, the water rises and falls, swelling up into a huge blue bubble, teasing you a number of times before it finally erupts into a stream of water that rises about 15 meters into the sky. It was a pretty fun game trying to capture the moment on your camera. I just extended my gopro on it’s go-pole and let it record until it went, while others were waiting patiently with their phones in hand, at the ready for the next eruption. 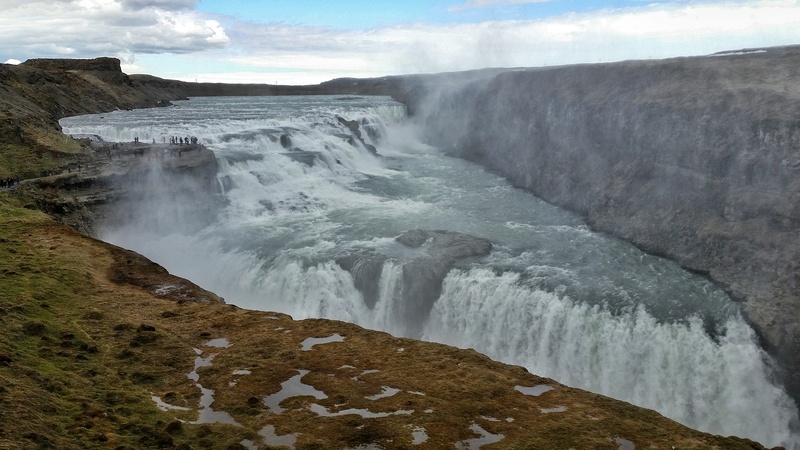 From Geysir, it was just a 10 minute drive to Gullfoss, a two-tiered massive waterfall that was very easy on the eyes. 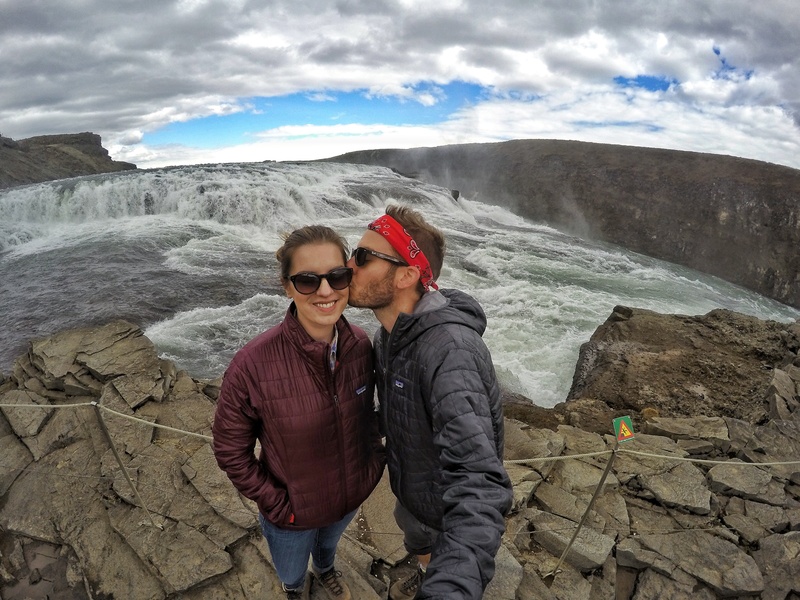 We viewed Gullfoss from all the various lookout points around it, before heading back to Hveragerði for dinner and relaxation at Frost og Funi. We really enjoyed our stay at this guesthouse – the hot pots were incredibly hot and perfect after a busy day of hiking and driving. After dinner, we met a nice couple from Berlin and shared a hot pot with them for a bit. The guesthouse was situated on a quick moving stream next to rolling hills filled with steam, which gave things an almost magical look. The hot pots were right down on the river bank, and the views couldn’t have been better. I knew at this point I was not ready to leave this place. 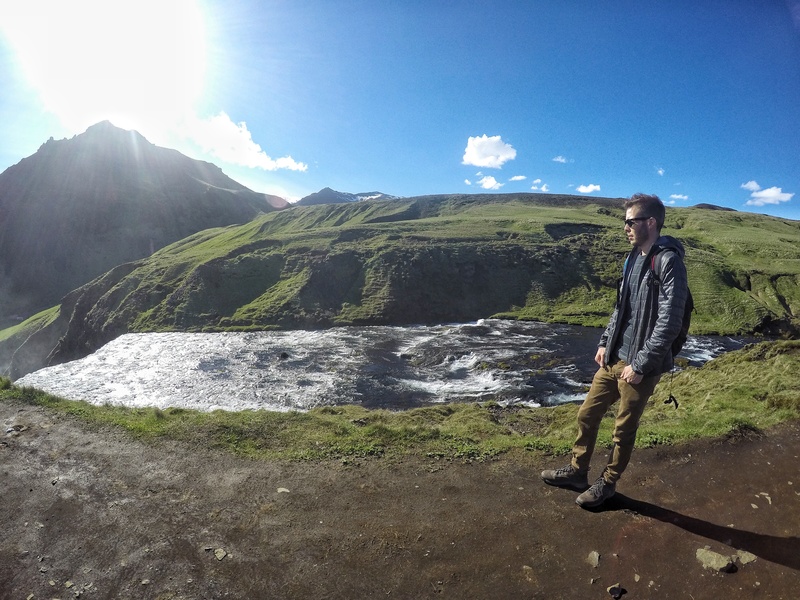 Click here for Part 3: Snaefellsnes Peninsula.